When our four daughters were very small and just beginning to learn to play their miniature violins, what I looked forward to—and what may have been my greatest motivator for facilitating all the lessons and practicing—was the moment when they would start playing together. I don’t mean in a Suzuki group, or one of those violin-top-heavy entry-level youth orchestras, or even a legit chamber ensemble. I mean really playing together, spontaneously jamming for pleasure and joy. It was a mythical moment, a golden era that I always fantasized was right around the corner, perhaps just a few months or years away when they would have the technical chops to hopscotch around the fingerboard and the intellectual facility to improvise their jazzy way through made-up melodies. But it never happened. Well, they did learn their way around the fingerboard. And they learned to sight-read, if not to improvise (the latter skill not part of a classical music education.) But somehow they were never able or willing to make music together in the extemporaneous, carefree way that I imagined. But there was no noodling around. Instrumental music provided immense satisfaction and camaraderie, but it was always goal-oriented. They practiced to improve technique; they rehearsed to prepare for lessons, performances, and auditions. It was a serious endeavor. When their friends asked, “Why do you do it, is it fun?”, they had no answer because it all depends on your definition of “fun.” Is track-and-field fun? Is Irish dancing fun? Can you value something deeply, even love it, when you must also wrestle with it constantly? It didn’t help that we had no bass voice. Each of them could play violin and, eventually, viola; a couple learned some piano, and even guitar and mandolin and djembe and a little trumpet. But, because I’d not had the foresight to assign one of them a hard-to-lug-around cello when they were little, as an all-sisters group they were stuck with a painfully limited sound palette. In some ways it was like the problem of a boychoir. Too much treble, like too much sugar hurts your teeth. Most years on Christmas Eve they were charged with playing some prelude music before the candlelight service at the small Lutheran church at the corner of our street. In the days leading up to these performances, their self-coached rehearsals devolved predictably into histrionic arguments—You’re coming in early again! You’re sharp! You’re flat! You’re covering me!—followed by the sound of feet stomping down the hallway and slamming doors. We would leave for the church ten minutes behind schedule, everyone frazzled, and the mood precarious. What was wrong with us, I wondered, that our kids could not work out how to play a few simple carols without practically killing one another? We would walk six abreast up the dark street, parents lugging two shin-banging Manhasset music stands apiece, and the girls, apple-cheeked in the moonlight, skittering across ice puddles with their instruments strapped on their backs. Four instrument cases will consume an entire pew’s worth of precious real estate in a tiny church on the most jam-packed church night of the year. I could feel the pressure of the crowd, so many strangers among the familiar congregants. Each year I would start out holding my breath—after that trainwreck of a rehearsal, how could they possibly get through the performance—? But I’d forgotten that there is no warmer audience than inside a overflowing church on Christmas Eve. Of all nights of the year, this is then one when the audience just really wants to love you unconditionally. They’re not there to poo-poo your historical styling in Jesu, Joy of Man's Desiring. They’re there for candlelight and carol-sing; they’re there to feel moved. Four little girls playing violins sets the mood well. Moments later, the violins would be tucked away in their cases and shoved beneath the pew, and then: on to Lessons and Carols. Around us would rise the voices of the choir, of the regular congregants, and their visiting cousins and grandparents, all the Christmas-and-Easter Lutherans, the nostalgic fallen Catholics, the curious neighbors, the Jewish boyfriends, the atheist in-laws, everybody singing the familiar songs. My kids would sing with gusto, should-to-shoulder, in their best-trained children’s choir voices, spontaneously improvising harmonies. They'd always loved singing together—on car rides, at the dinner table, lying awake in their beds at night. When the service was over, we’d order our traditional take-out Chinese food for a late-night feast in the dining room festooned with holiday garland, then crowd around the piano for hours singing wintry, modal-sounding ancient carols ("In the Bleak Midwinter", "The Coventry Carol" (with its famous picardy third—bye, bye, lully, lullay. ), and a few other favorites: Ruth Crawford Seeger's American Folk Songs for Christmas, "Walking in the Air", from Howard Blake's The Snowman, and "Little Toy Trains" and "Douglas Mountain" from the Raffi Christmas Treasury. Pass a decade, or more. Wednesday evening, riding in the minivan to my parents' house for Christmas dinner, the girls were singing "Lo, How a Rose E'er Blooming" in close harmony in the back seats, their voices blending so perfectly that they sounded like a chord played on a single instrument—and then breaking off into laughter, and restarting. We'd all been up late the night before, after the church service, during which one of the sisters, the only one who is still studying music, played solo Bach movements on violin and viola at the prelude. Then the frozen walk home through the inky dark, the Chinese food by candlelight, and the hours of singing at the piano. I realized then that my own heart's desire has been with me all along. It was a ruby-slipper revelation. My daughters have been jamming together since they were small. Their voices, untrained but not uneducated, thanks to years of instrumental study, are an easy, natural medium for improvisation. Thanks to violin study, they have an acute sense of pitch and a prodigious memory for melody and lyrics. They can be playful because singing, a "mere" hobby comes without the pressure of a goal or project. It lives in the moment. And the moment is ever-vanishing, How many Christmases, or even weekends, will they have together, as they grow older and their lives more complicated? Occasionally they wonder aloud if they should record themselves "so we can listen to it, years from now, and remember." For an instant I flash on my future self, and the simultaneous heartbreak and joy of some day rediscovering this as-yet-unmade recording. Can the moment be caught and preserved, to be unwrapped in some distance future like a treasured ornament? Perhaps its fleeting nature is what brings its paradoxical value. What a wonderful post. With kids, things often work out the way you wanted but not in the way or along the path you envisioned. Have a good holiday and New Year. I know what you mean about lacking a bass voice. I started an orchestra recently for all my students and it soon became apparent we would need bass instruments as well, so cellists and a double bass player were auditioned and recruited, and we now have a mandolinist as well, with a guitarist/balalaika player about to join. It's a lot of fun and we're doing our first performance (folk, gypsy, Klezmer etc) in March. Re the noodling side I do think that will only happen naturally if classical music isn't the only focus once a good basic technique and good intonation have been established. Then you can factor in some teaching of improvisation - jazz and otherwise - to free up their imaginations and enable them to make stuff up by ear as well as learning the Suzuki repertoire that way. Do all this with the grandchildren and then your dream will come true a generation down! Great story!I've played violin for 15 years, and then fiddle for another 5. When I started fiddle, I got my mom to start bass, and my 8 year old (at the time) guitar. Five years later we are making beautiful music at every family function. It's expected now! 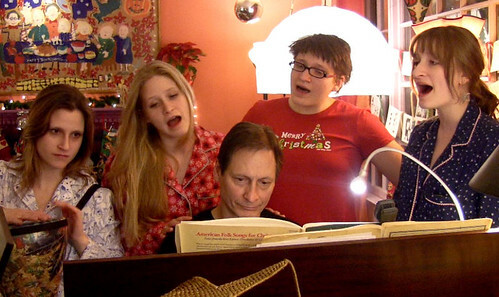 Not only does our family participate, but friends of the family come over just for the singing and playing. I hope our family continues these traditions for a long time! Thank you for your wonderful post. It really made me feel like Christmas there for a minute. And I had to laugh. My mother (and later my sister-in-law) tried to get all three of us siblings to perform together, with absolutely no success. Which I now for one, regret. Both mom and Kathy are gone, and how hard could it have been to work up a few numbers to give them as a gift they would have loved? I think your daughters should make that recording. With the technology available nowadays, it's easy as pie. Request it as the one Christmas gift you want, period. Life is fleeting. Seize the day! Thanks, Jeff--that is a brilliant idea! I will manipulate them into making a recording for me. Maybe even more than once. It could be a new holiday tradition. You're right, these moments are fleeting.